I get tons of questions about how to go deeper to align your CliftonStrengths talent theme of Ideation with your career. So in this series, I break down one strength per post. I bet you are like many of my StrengthsFinder training clients, where you don’t see your teammates and customers every day. That’s why LinkedIn has become so important for career branding. It’s where your teammates, customers, and vendors go look you up before a meeting – to see who they’re about to talk to. These are the cultures, interactions, or situations that feel like soul-sucking drudgery to someone with the talent theme of Ideation. They might even make you want to quit the team. So I’ll give you a couple of these to be on watch for — because if they fester, you might get the urge to disengage on the job or become detached at work. The “Yeah, But” Team. This is the team where there’s a table full of devil’s advocates ready to pick apart every idea. See, if you lead through Ideation, you love having ideas. You love exploring ideas. You love talking through them to see what they could turn into. If you’re part of a team that instantly greets new ideas with “Yeah, but that will never work here” or “Yeah, but we tried that two years ago and it didn’t work” “Yeah, but” “Yeah, but”…you’re going to feel really shut down if you lead through Ideation. The “Little Less Talk And A Lot More Action” Team. This is the team that loves to execute and crank out volumes of transactional work. If you’re on a team with this type of job responsibility, be on watch for what’s valued in the culture. Often you’ll hear that they need less talk and more action, which to you means fewer ideas, less exploration, and less growth. Which leads to boredom. Which leads to the death of your soul. I’m dramatizing, yet if you lead through Ideation, you likely love to think and dream and expand beyond what’s going on today – and to do that requires thinking and talking through new ideas. If your ideas constantly get squashed, you’re likely to feel like the environment is a total downer for you. These are ways to apply the talent theme of Ideation at work, even when the job duties on the team feel pretty locked in. If you’re listening as a team manager, be sure to have a conversation around these ideas. You’ll both be able to come up with places to apply them. Making Unlikely Connections. People who lead through Ideation are great at brainstorming ways that things could be repackaged or reimagined. For example, they could take a stale product line and bring you 3 ideas for ways that they could be refreshed or remixed to solve a new problem for customers and create new revenue streams. The Blue Sky Dreamer. If you want the team to be thinking about what you could accomplish if you really dreamed big – without constraints – this person will be great at leading, generating, and even facilitating this kind of thinking from others. When you’re trying to pull the team out of the status quo, someone with Ideation would love spearheading that type of mental exercise. 10 Better Ways. Lets say you work in a customer-facing role, and your team uncovers that customers do not understand or use your help page when they have an issue. If you assign the person with Ideation to come up with 10 better ways of solving the problem for the customer, they will likely have a blast and offer innovative ideas that the team loves. So there you have it. 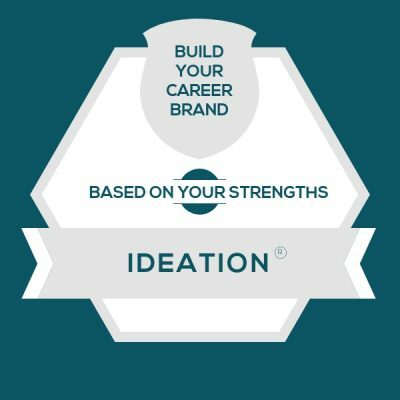 It’s a quick tour for building your career through the talent theme of Ideation.